Che Thai is our easy go to summer dessert when we’re serving lots of guests and in a crunch for time–we served these at our last 2 parties and it always seems to run out. It’s by far the easiest desert to make because there is no baking or cooking involved. Che Thai, as the name implies, is a Vietnamese take on a classic Thai dessert tub tim grawb with faux pomegranate seeds and coconut milk. 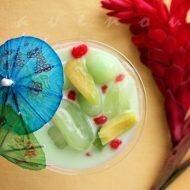 Vietnamese have added a variety of local fruits including jackfruit, lychee, longon, and various jellies to the concoction that’s best described as a Vietnamese fruit cocktail. 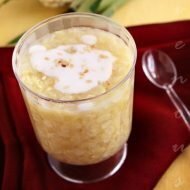 Although the traditional Thai desserts uses coconut milk, half and half is a great substitute since it’s readily available and there is no fuss about the milk curdling when the dessert is served cold. If you want more coconut flavor, you can use some coconut cream or try, Andrea Nguyen’s coconut milk sauce recipe. Typically this dessert is made from canned fruits. All you need is to buy the fruits and add half and half and tadah….you have a desert that all guests will enjoy especially on a hot summery day. For an extra textural and color contrast and a tiny bit more work you can add real or faux pomegranate seeds made from water chestnuts and tapioca starch like we did. We promised it would be easy. A refreshing and colorful dessert in a jiffy! In a large fruit punch bowl add the jack fruit, lychee, and longan along with it's accompanying syrup. 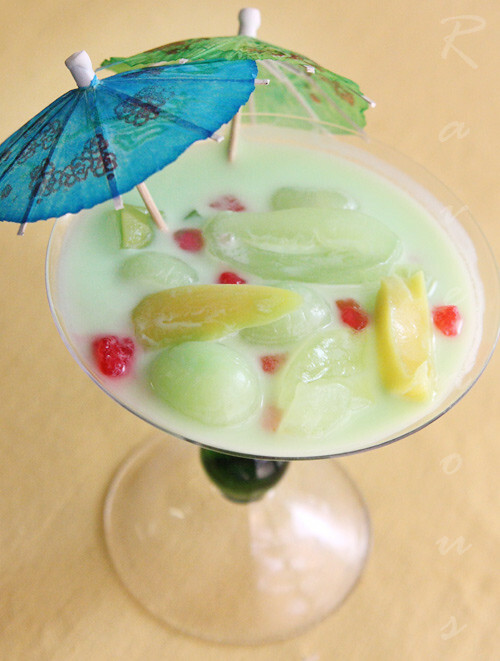 Drain the toddy palm and coconut jelly and green jello and add to the mixture. You can also add the pomegranates as this point. When ready to serve, add the half and half to your desired level of richness and stir everything together. Serve cold. You can refrigerate the mixture until cold or just add ice to the punch bowl. *Cooks Note: For more coconut flavor, use 1/2 coconut cream and 1/2 half and half. This is one of my favorite childhood desserts, and I have been craving it recently in this hot weather. I simply loved the medley of fresh tropical fruits and chewy jello textures. For one reason or another, I've always prefered the faux pomegranate to fresh ones, go figure. LOL! Christine: It's the chewy texture…like boba! Such a pretty green! Anyone who is served this would definitely first pause to admire it. 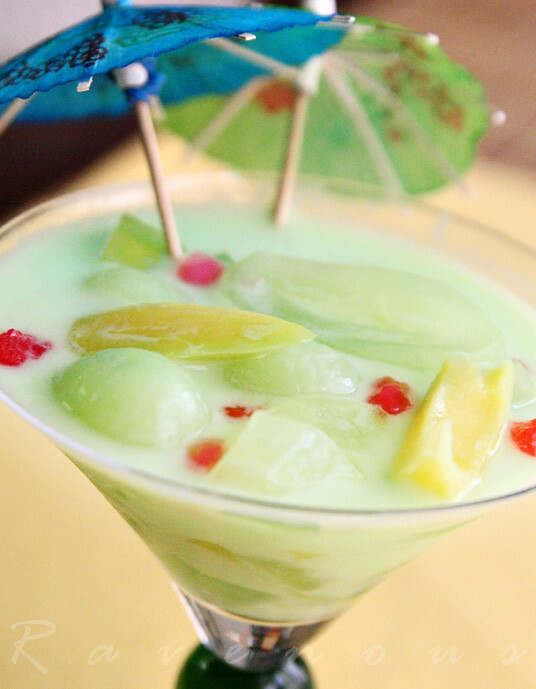 Jackfruit and lychee and toddy palm are so good….this is so pretty and healthy looking…. 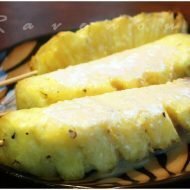 Glad to see someone finally posted about this treasure of a recipe. We make it at every party and it's always a hit! What a great summery dessert! And, I'd love to try making faux pomegranate seeds. Hi, i love che thai and i always wanted to add the faux pomegrante seeds but i don't want to make my own and i don't know where to buy it from! I live in OC and even though i go to the vietnamese/chinese markets around, i don't knoe what section or what they are called in vietnamese. help? thank youu! The dessert looks really yummy! My mom likes adding durian to her version for more things to munch on. I used to work at Lees Sandwiches and this one sells more than the others when they have it available. THANK YOU for posting this. 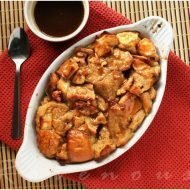 I love this dessert! My aunt made it the other day using a french vanilla creamer. it was delicious! But I'm very excited to make your version, which I proudly had many cups of at your place last time! faux pom is my all time favorite ingredient in che. This post is making me thirsty! Sophia: we've never seen pre made faux pomegranates before–there are many tapioca pearls that you can use as a substitute though. Alisa: yes, adding durian is definitely another popular fruit..interesting to know it's of of the most popular at Lee's! Evelina: OOh, love hearing about all these different variations..french vanilla creamer sounds good! Wow, this looks amazing. Absolutely perfect for the summer! mmm…Chèèèèèèè. There's a famous spot here on Nguyen Tri Phuong street for chè thái, have you been? They throw durian in as well. How much does the king of fruits cost back there? @mysimple food: can't have it without jackfruit, it adds color and flavor too. i read your blog and it was great just like Tropics Food Products Cooperative they gave also a lots of information you want. Hi, I just tried making this and I have a few questions. Do I need to slice in half the toddy palm, lychee or longan? Also, the green jelly I bought was this dark, black looking color, it wasn’t bright pretty green at all. Do you think I got a bad one? I put real pomegranates in mine, but everyone says it was too sour, How does the faux one taste like? Can I buy that or do I have to make it. Thank you! Love your blog! keep the toddy palm whole, it’s hard to cut. if you want to cut the lychee and longan, then that’s ok, but really your choice. the jelly should be green ai yu jelly. the black one is a different color and different taste, but it’s not bad. the faux one is just tapioca flour and red color and has chewy texture. you can search for faux pomegranates on the web for that recipe. Went looking through the recipes here last night and came across this. I personally don’t care too much for this dessert, however my parents LOVE this. So I’ve decided I’m going to surprise them with this on Friday. Bought ALL the ingredients today at an Asian market. I was very surprised to find everything at the market because they don’t carry much ingredients here. Usually I’d have to drive to Houston (3 hours away!) to get most of my asian groceries. I can’t wait to try to make this on Friday! Seems simple enough. However, I would like to try this by using the suggest 1/2 coconut cream 1/2 half and half. When you say this, do you mean by 1/4 a quart of each to make the required 1/2 qt listed in the ingredients. If that makes sense? Sorry! Hong& Kim- I am so happy I came across your incredibly deliciouso & informative site! This dessert is a knock out at our parties! This is my Thai/Laotian version. this will probably serve 6-8 depending on cup size.